Home » Blog » Leather Rules! 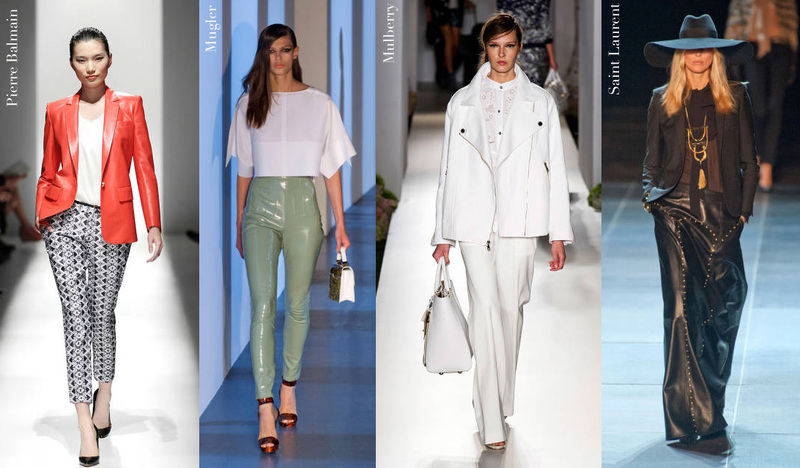 We saw so much leather on the Spring 2013 runways this season – whether it be coats, pants, skirts, dresses or basic applique – it was everywhere! What is it about leather that we love so much? Its quite simple, actually. Leather is versatile. Depending on the piece, leather can dress you up or dress you down. It can add edge to any outfit while remaining feminine – or it can be completely rock n’ roll. Although we were inspired by leather on the runways, we felt that is lacked a bit of color. The leather pieces were predominantly white, black, red and with few neutrals. Yes, those colors are great, but at the same time - it’s Spring/Summer!! We believe that colors should be bright and bold for summer to match the beautiful sunny days that await us. Not many people could dress like runway models (it’s not always very practical), so we decided to make something a little bit more simple: Faux leather leggings. And no, these leggings aren’t black, white or red. We brought them in coral, mint and pearl! We want you to stay bright and make a statement during the summer! We also want you to have a wardrobe stable that changes every time you wear a different top!